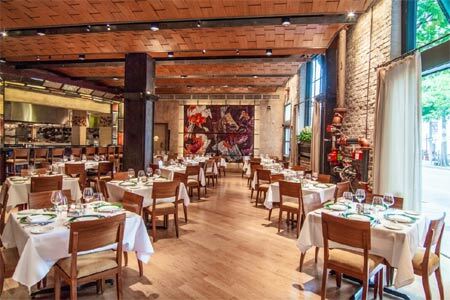 Emeril’s offers fine dining with a contemporary flair in the Warehouse District. : Chef Emeril Lagasse’s flagship fine dining establishment remains one of New Orleans' authentic culinary gems. Lagasse doesn't appear in his eponymous restaurant very often, but his staff of talented culinarians is on the job. Huge barbecued shrimp come enrobed in a robustly seasoned brown sauce. Meat lovers will go for the double-cut pork chop with caramelized sweet potatoes. If you choose to go Southern all the way, opt for Emeril’s chicken and waffles, or Gulf shrimp with sweet potato grits. Desserts to consider include a chocolate Grand Marnier soufflé and the chocolate/peanut butter mousse cake. The wine list is as thick as a Russian novel and equally well composed, with a fair number of bottles priced below $35. Professional service teams keep things humming at the tables. The food bar affords a panoramic view of the kitchen. Framed like a stage's proscenium arch, it's bordered with back-lit glass cases holding colorful seeds, grains and spices. If there is a downside to Emeril’s, it is the noise level, and the menu is a bit pricey compared to similar local restaurants.